Studio Line: MGM - The Rematch Of The Century. After club fighter Rocky Balboa (Stallone) goes the distance with the world heavyweight champion, boxing fans clamor for a rematch. But Rocky, having sustained massive injuries in the bout, announces his retirement. Though he tries to make a new life for himself, Rocky realizes that he can't escape his true calling. The ring beckons once more, and the "Italian Stallion" must prepare for the fight of his life. DVD: Widescreen 1.85:1, standard 1.33:1; audio English Dolby Surround, French & Spanish Monoraul; subtitles English, French, Spanish; closed-captioned; double sided - single layered; 32 chapters; rated PG; 119 min. ; 4/24/01 - available on the boxed set only. Sometimes it’s not best to give the people what they want, a point that is proved succinctly in Rocky II. (Watch out - potential spoilers ahead!) Oh, it’s not like the original 1976 Rocky lacked crowd-pleasing elements. In fact, its rousing lack of cynicism may have contributed mightily to its success over the year’s more dour and hard-bitten releases; Rocky grossed a ton of money, and it also won out at the Oscars, where it topped strong contenders like Network, Taxi Driver and All the President’s Men. Nonetheless, one aspect of the movie stuck in some people’s craws: Rocky loses the big fight. Many people - myself included - think the current ending is absolutely appropriate; it fully supports the old contention that it’s not whether you win or lose, it’s how you play the game. Rocky’s tough stance during this defeat was something of a moral victory as it showed how the little guy can come out okay after all. Still, although the ending made perfect sense within the film’s context, some folks were disappointed that Rocky didn’t emerge totally victorious. These are the same people who probably feel that 1979’s Rocky II is the better movie of the pair. In fact, it’s vastly inferior to the original, but since it delivers the desired happy finale. Some have accused RII of being a virtual remake of the original, and those comments aren’t too far off-base, though there obviously are quite a few differences. Nonetheless, the sequel tries awfully hard to put Rocky back in the position of hopeless underdog, something it never really achieves. The early parts of RII are the most compelling. 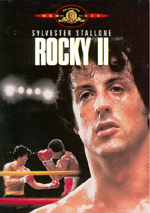 The movie starts - as do all of the four sequels - with the conclusion of the prior film; again we see Rocky’s (Sylvester Stallone) near-victory against boxing champion Apollo Creed (Carl Weathers). From there we find out where Rocky’s life goes as he deals with his newfound celebrity. Unfortunately, he quickly runs out of economic options, and since his injured right eye makes it risky for him to box - one wrong punch and he could go blind - it looks like Rocky’s back to being a bum, just like in the first film. I enjoyed the brief look at Rocky’s flirtation with success, but once the movie puts him back in the position of underdog, it quickly sinks into a tepid series of clichés. Clearly writer/director Stallone - who would also helm the following two sequels before Rocky director John G. Avildsen returned for the fifth film - wanted badly to put Rocky back into the role of lovable loser, and the movie strains to do so. It never seems convincing, and no parts of the flick made it work. Much of the problem stemmed from the superficial presentation of the main characters. The original film was really about all sorts of people who’d struggled through life and never been able to achieve their goals; Rocky himself just acted as the stand-in for anyone who’d felt less successful than they’d like to be. Except for champion Creed and his camp, all of the main participants bordered on the dregs of society, and the movie let them stand up for themselves and have their day on top. Rocky II should have been better able to explore the nuances of these characters. The first movie introduced them, so the sequel should have been able to expand on their personalities. Instead, they’re all reduced to caricatures of their old selves, and no new dimensions are added. Rocky’s girl Adrian (Talia Shire) is nothing more than a token babe in the sequel, and her brother Paulie (Burt Young) simply redoes his loudmouth shtick from the first movie. Trainer Mickey (Burgess Meredith) loses all humanity and becomes a gruff screamer with no other reason to exist. As Rocky, Stallone at least kept within the stumblebum nature of the original character - a tone that would disappear beneath the actor’s vanity in the sequels - but otherwise the sequel’s star has little in common with the original character. Stallone keeps Rocky likeable - another dimension that would disappear in the later sequels - but he lacks the warmth and the charm that we saw in the first film. Instead, he feels like a cardboard impersonation of the old Rocky; I didn’t dislike him, but I didn’t really care about him either. Virtually all of Rocky II seemed like a cheap knock-off of the original. They added superior production values and gave it a happier ending, but otherwise it’s the same old song and dance, just without equal levels of spirit and conviction. The climactic fight scene lasts longer than in the first film, but it appears less substantial, as the razzle-dazzle lacked grit and depth. In the original, the bout was a war, but here it’s just a show. Add to that some plot twists that verge into soap opera territory and you have a less-than-successful sequel. Make no mistake - Rocky II isn’t a terrible movie. It offers some entertaining sequences, and it looks quite good when compared to some of the other sequels. However, on the heels of a movie as charming as Rocky, the first sequel is a big disappointment. Stallone wanted to have his cake and eat it too, and the result is a movie that can be interesting but that never becomes fulfilling. Rocky II appears in both an aspect ratio of approximately 1.85:1 and in a fullscreen version on this double-sided, single-layered DVD; the widescreen image has not been enhanced for 16X9 televisions. Only the widescreen picture was reviewed for this article. Although this movie showed improvements over the first film, the lack of anamorphic enhancement also caused some problems, so the ultimate result was only a little better than average. Sharpness usually seemed quite good. A few sequences came across as mildly soft, but these were exceptions, as the majority of the film provided a nicely crisp and detailed image. Unfortunately, the absence of a 16X9 transfer meant that resolution wasn’t as high as it could be, and the result was a fair number of examples of jagged edges. Some moiré effects also appeared, but it was the jaggies that caused the biggest distraction in this department. However, those concerns weren’t the main problem I found during Rocky II. Instead, print flaws brought on the gravest issues. The film abounded with defects. These mostly consisted of grain, grit and speckles, with the occasional nick or hair as well. However, though the flaws were of the small variety, they appeared with enough frequency to cause definite problems; speckles especially flared up on a lot of occasions. Colors largely seemed quite satisfying. The film utilized a fairly restricted palette since the movie’s Philadelphia setting didn’t lend itself to a lot of bright hues, but the tones appeared fairly clean and rich. Reds especially came across well, as could be noted through some of Adrian’s clothing. Black levels were also pretty deep, a factor witnessed in Rocky’s leather attire, but shadow detail was a bit bland and vague. Low light situations never seemed terribly heavy, but they appeared a little thick and lifeless. In any case, Rocky II presented a watchable but somewhat problematic image, mainly due to a surfeit of print flaws. The Dolby Surround soundtrack of Rocky II also was just slightly above average for its era. The soundfield appeared modest but acceptable for this kind of film. The forward spectrum showed decent breadth as music presented fair stereo separation, and minor effects elements spread across the front channels. These resulted in some mild atmospherics that also seemed to blend together in a fairly pleasing manner, but there wasn’t a great deal of life to be heard, at least not until the climactic fight. That sequence was really the only time that the surrounds played a fairly significant role in the mix. During the bout, the rear speakers added a nice element of involvement as the crowd noise got me into the match. Otherwise the surrounds mostly contributed musical reinforcement and general ambience without a great deal of activity. Audio quality appeared adequate for the film’s era. Dialogue seemed mildly thin for the most part, but the speech remained acceptably natural and always came across as intelligible with few elements of edginess to be heard. Effects also seemed somewhat flat and drab, but they lacked distortion and appeared modestly realistic. Music displayed too much mid-range, though some low-end kicked in from time to time and the track portrayed the score in a reasonably clear manner. Ultimately, the whole mix suffered from a case of the blahs, but it worked decently well for an effort from the late Seventies. Less satisfying were the DVD’s extras. While the new release of Rocky added a slew of supplements, Rocky II - and all of the other sequels - got the shaft. All we find on this disc is the film’s theatrical trailer. This seems especially chintzy since RII originally came out on DVD in 1997, and that package at least included an eight-page booklet. No similar text comes with this new disc, as a leaflet with chapter listings replaces it. Boo! A nice mix of extras certainly would have made Rocky II more appealing; the movie itself didn’t do much for me. Oh, it’s a fairly entertaining piece of fluff, but it lacks any form of depth or drama; all it represents is a happier version of the first movie. The DVD provides adequate but unexceptional picture and sound plus virtually no extras. Serious fans of the series will want to give Rocky II a look, but otherwise I think it’s not a terribly worthwhile endeavor. Note: although this DVD of Rocky II appears to duplicate the one originally released in 1997, that older disc no longer is in print. You may still be able to find it in stores, but MGM aren’t making it available to distributors. As such, it’s possible that you may not be able to find Rocky II on DVD anywhere other than in the Rocky collection boxed set; that package includes all five films.